When buying goods on the internet you are entering a legally binding contract the terms of which are outlined below. All orders will be deemed to be conclusive evidence of your agreement to these terms. These terms and conditions apply to all sales unless specifically agreed otherwise by us in writing. Payment may be made by credit card, cheque with order or cheque on delivery. The payment by credit card will be debited on the day of or the day before despatch. We do not need to take your card details on line, you can give us the details by phone when we are advising you of the delivery date. Orders for commercial structures or special order goods will be subject to a down payment with order and the balance to be paid in full on delivery. The down payment is non refundable should the order be cancelled outside 7 days of order. Credit accounts may be opened for customers who have a proven track record of purchasing regularly from us over at least a six month period. An account will be given subject to our approval after checking on trade and bank references. Credit facilities not operated within month 30 day terms and within agreed limits will incur statutory interest charges and the facility may be revoked at our discretion. Our VAT Number is IE 6416015J. VAT is included in all prices on this website at the rate prevailing at the time, unless stated otherwise. When you choose to have our construction service or technical assistance service the VAT rate applicable lowers to the rate applicable at the time for construction contracts. In pricing our construction service we have taken the reduction of the VAT rate into account, so that the total price for materials and construction is the correct gross total including the lower VAT rate. Products bought on the website will be charged at the price shown at time of order. When we are delivering a structure at an agreed date, if the customer fails to take delivery we reserve the right to charge a supplementary delivery cost. For construction contracts where the conditions during construction fail to meet the criteria specified in our terms and conditions for construction contracts which are shown at time of order (and which the customer will have a copy of with their order confirmation), we also reserve the right to charge extra as set out in the construction terms and conditions. We endeavour to deliver at least within 30 days of order but with special orders or due to unusual demands or unavailability, this lead time may be longer. If we cannot deliver within 30 days we will advise you and agree another date. If you are not agreeable to a revised delivery schedule we will refund any payments you have made.Where delivery dates are given they are without liability. Prices for structures include delivery on our own scheduled transport. The frequency of delivery depends on your location - please check with us at time of order for the next scheduled delivery to your area. Orders for accessories are normally despatched by courier within a day of order. We charge delivery on accessory orders and the amount will be shown before you arrange payment. If customers wish to have delivery at a date or time other than our scheduled runs a charge for delivery will apply. Please discuss your requirements with us and we will endeavour to accommodate you. A delivery surcharge of € 80.00 applies for deliveries to Peninsula off Cork, Peninsula off Kerry, County Donegal and for deliveries to Northern Ireland. Title to the goods does not pass until payment in full has been received by us. We reserve the right to enter the premises of a debtor to recover goods for which payment is outstanding to us and resell all or part of the goods, without prejudice to our other rights. (a) The item is returned to us at the customers cost and risk. (b) The goods are received by us in what we perceive to be perfect condition, i.e. fit for resale at the full price. (c) The cancellation has been made in writing and despatched to Polydome within 7 days of delivery (must be received by Polydome within 14 days of delivery). Irrigation and Polytunnel orders are labour intensive products and as a result will incur a handling and administration fee of 15% of the value of the goods plus transport and packing costs if an order is cancelled (also subject to the criteria outlined above). We reserve the right to cancel the contract between us if one or more of the items you ordered were listed on our website or electronic documentation at an incorrect price due to hardware/software failure or a typographical error in the pricing information. After placing an order if a customer wishes to make alterations to the size or features of their polytunnel or to cancel the order after we have processed and picked their order a fee will be chargeable for making the alterations, the cost will be dependant on the scale of the changes and the extra work involved for us. The fee only relates to alterations that involve restocking goods already picked, we of course welcome any additions to orders which do not involve restocking goods already picked. For non stock items or commercial orders, down payments (deposits) are required with order. The down payment is non refundable unless the order has been cancelled in writing within 7 days of the initial order. We will only keep information which is useful for providing a good after sales service to customers, credit control and that which complies with current legislation. The proprietor, Jonathan Pyle is responsible for the upkeep of information and can be contacted at our contact details given on all pages in the website. The details we keep on file are your contact details, credit card details, details of goods ordered and marketing details. You may obtain a copy of the details we have on file by emailing or phoning us. We will give you the opportunity to refuse any emails and mailings from us or from another trader in the future. The prices given for construction are subject to terms and conditions which will be outlined before ordering the construction service in the ordering sequence on this site. There may be extra labour charges if extra work is required due to conditions at the customers end not being as described in our terms and conditions or if installation of accessories is required. Placing an order for construction is taken as proof of acceptance of the terms and conditions. It is the ethos of our company to grow our business through having satisfied customers. If there is anything wrong with a product or service we have supplied, we would be grateful if you would tell us and give us an opportunity to address the issue. We guarantee our Polythene Covers for a specified number of seasons against UV degradation. In the event of a cover not lasting the full term, we will have a sample of the film tested by our suppliers for UV degradation and on confirmation that this was the cause of the failure give the customer a credit off their next purchase equal to the value of the unused portion of the warranty period (i.e. the original cost price of the film, divided by the number of months of the warranty period, multiplied by the number of months left to run on the warranty when the defect was notified to us). For example if a cover cost €500, had a warranty of 50 months, the cover suffered UV degradation after 40 months, then the customer will be due a credit of €100. No consequential loss or liability will be accepted and the labour cost is not covered. As Polythene by nature can be damaged easily on site even without realising it, the onus is on the customer to check their polythene immediately on delivery and report any damage to our driver. Claims for 'mechanical' damage (physical damaged caused through handling) cannot be entertained beyond that point. If it has been damaged during transport the packaging will also be affected so will be noticeable. The primary place of concern is at the ends of the roll where the polythene is folded so damage on the folds can run through the cover, damage to the main body of the roll usually only affects the start of the sheet much of which will be discarded anyway. Where there is an imperfection in the polythene caused during manufacture – for example, discolouration, creases or similar issues, these do not materially affect the life or satisfactory use of the Polytunnel, they are aesthetic issues which are not valid warranty claims in our opinion. If a cover has a small number of holes like cigarette burns we will repair the damage and give the customer a free roll of repair tape. If a cover has issues which in our opinion will materially affect the lifespan or satisfactory use of the cover we will at our discretion offer a full or partial refund or replacement product depending on the circumstances. All our structures are guaranteed for one year against faulty workmanship or defective parts (deemed defective in manufacture). The limit of our liability will extend only to the supply of a replacement part and not to the labour for installing it or to any consequential loss or damage. 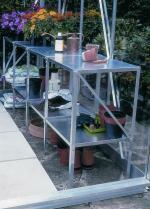 Our policy regarding damage to Glasshouse Frames – it is quite common that in transport aluminium sections can be slightly damaged (by its nature it is a soft metal), however the damage can often be satisfactorily sorted out on site by the person assembling the Greenhouse. If a customer is not happy repairing the damage on site and wishes to have a replacement part we will be happy to supply one free of charge – however this may take some time if the part is not a stock item. We recommend that you inspect your parts and effect any repairs before the day set aside for construction to avoid any inconvenience. 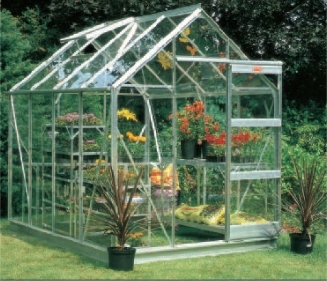 If a customer is hiring a third party to build their Greenhouse or Polytunnel we recommend they thoroughly check out the kit of parts before the constructors arrive on site as Polydome cannot be held liable for any consequential costs caused by parts being missing other than our normal logistical costs of having the part delivered to you in a reasonable period of time. Customers should bare this in mind when pricing third party construction services (our constructors generally bring spare parts with them to cover for most eventualities, third parties will not be doing this). Should parts be discovered to be missing by the customer – generally we will despatch a replacement part that is in stock the same day or next working day by an overnight courier service. If the item is particularly large we may have to deliver it using our own transport in which case it may take several weeks. Very occasionally parts may be out of stock the delay may be longer. Thankfully we are certainly one of the largest stockists of Glasshouses and Polytunnels in the country so can offer a better service for spare parts than most. All goods must be inspected on delivery for damage and/or shortage and any damage or shortage must be reported to Polydome Greenhouses in writing within a reasonable period of time depending on the nature of the problem. If a customer collects a greenhouse and transports it themselves we cannot accept any liability for broken or damaged goods. All our responsibilities, except those specified above, cease on delivery of the goods. Delivery will be determined to have taken place as soon as the goods have been unloaded at the customer’s premises or as soon as they have been loaded onto the customer’s vehicle at our premises. Neither party will be held liable for loss or damage or injury to the other party caused by an occurrence whatsoever that is beyond the control of the defaulting party, including but not limited to industrial action, power failure, breakdown of plant and machinery, order of any Government Authority or shortage of supplies. The defaulting party will give the other party notice at the earliest opportunity in writing. At Force Majeure having been declared by the company, the customer may cancel the order without giving any liability to the company after first giving written notice at the earliest opportunity. Any disputes will be subject to Irish Law and will be subject to the Jurisdiction of Irish Courts (in Southern Ireland).